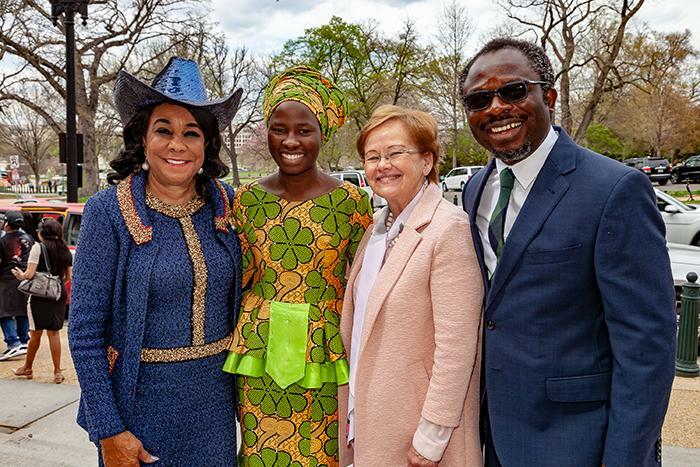 Ensign was part of a panel organized by Congresswoman Frederica Wilson of Florida, who has arduously engaged her congressional colleagues to ensure that the Chibok girls are never forgotten and to raise awareness of the havoc that Boko Haram continues to wreak in Nigeria. In addition to remembering those still being held captive, Wilson wanted to celebrate the efforts of the former Chibok girls, now young women, who are rebuilding their lives and planning their futures. Ensign shared information about Dickinson’s Bridge Program, which she established last year to provide educational opportunity to young people from regions of the world experiencing conflict and natural disasters—and for whom higher education would otherwise be impossible. Members of the Dickinson community participate in a forum in the Rayburn House Office Building in Washington, D.C. Photo by Carl Socolow ’77. Joining Ensign on the panel was Jacob Udo-Udo Jacob, a visiting international scholar at Dickinson, and Patience Bulus, who is enrolled in the Bridge Program. Bulus managed to escape her Boko Haram captors and shared parts of her story last year with The Philadelphia Inquirer. She is now focused on her education and bringing attention to the more than 100 Nigerian women who remain missing.